Editor’s Note: This is a Convince & Convert Greatest Hits post, which originally ran on the Convince & Convert blog in December 2015. Clicks! They aren’t the ultimate goal of most marketers (because actions are way more important than eyeballs), but it’s certainly better to have clicks your website, blog, or other digital property than to not have clicks. Of course, you could create better content and/or create more content in your quest for more clicks. We talk about that all the time on this blog. But here are five other, sly ways to get more clicks that perhaps you haven’t tried yet. Think about how many people are in your organization, and how many emails they send every day. Now think about how perfunctory their email signatures are. Each of those is an opportunity for timely, consistent calls-to-action that generate clicks. 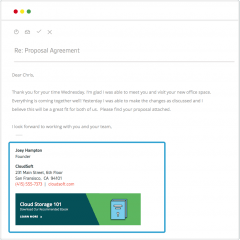 Sigstr (a sponsor of our awesome Business of Story podcast) provides an inexpensive, elegant solution to automatically implement branded email signatures across your entire team. Sigstr includes full tracking and the ability to change signatures on the fly. We’re rolling it out here at Convince & Convert, too. You may be looking at this one right now. It’s at the top of almost every page on Convince & Convert. It’s the little “window shade” that pulls down, promoting our latest webinar, ebook, or other project. You can also configure it to be a full pop-up or slide-out, if you prefer. Get Site Control works on all sites (not just WordPress), and you can customize the pull-down to include surveys, polls, email signups, and even social sharing tools. Great, detailed stats are included, and it’s easy to run A/B tests. Another one of our favorites at Convince & Convert, this killer app powers our “you might also be interested in” feature that you’ll find at the bottom of this blog post. Super easy to use, the power version of Contextly is just $99/month and gives you a ton of control in how you acquire more clicks. Pick the color, font, size, and arrangement of your related items, and you receive detailed daily stats reports. Built-in A/B testing is a big plus, as is the ability to create custom calls-to-action and “force” them to appear on all posts. (The Manipurated one below.) And, as you type posts (like the one I’m writing right now), Contextly will read the content and recommend the most logical related posts to include below. You can override whenever needed. This is a must-do if you have a video content program. Video cards replaced annotations earlier this year, and Christian Karasiewicz gave me the idea to include them in this list of sly ways to get more clicks. He even created the definitive blog post on how to create, use, and measure Youtube video cards (which are free, by the way). Grab that post right here. On every Facebook page you manage, you can select a distinct call-to-action that is prominently featured in the corner of your cover image. While most of your interactions on Facebook will occur within News Feed/Timeline, for people who do visit your Facebook page (typically these are new fans), giving them this easy opportunity to visit your site, sign up for your email, etc. is a great (and free) way to get more clicks. Hat tip to Christian Karasiewicz for this one too. Take a look at his very good blog at ChristianKOnline.com. Dollar Shave Club reports a 2.5X increase in sign-ups after implementing the call-to-action button. Here’s a case study on that, as well as the official Facebook how-to. Note that you can also use CTA buttons in Facebook ads built in power editor. A great post on testing various buttons here, by Digital Marketer. 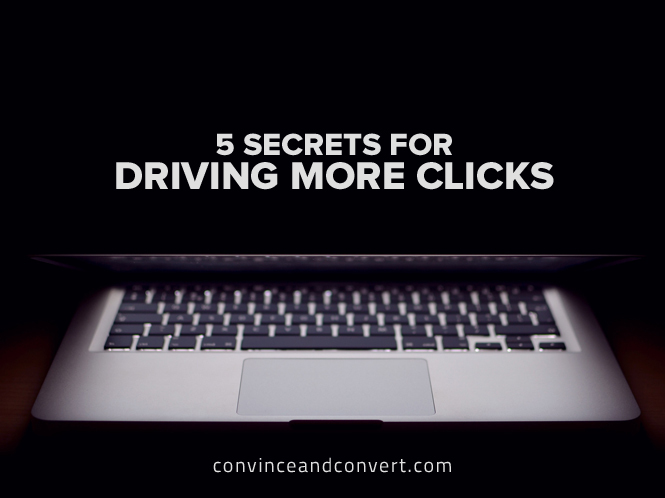 So that’s my five sly ways to get more clicks. I know I missed a TON of them. What ideas do you have? Leave them in the comments below.